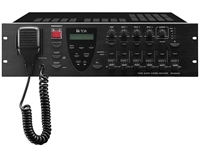 SX-2000SM can be used in combination with an optional audio input unit, audio output unit, and remote microphone of the SX-2000 Series to make up a complete matrix system and can perform audio signal routing and priority control for the entire system. The SX-2000AO is an audio output of the matrix system. Multiple units can be decentralized in a whole system. 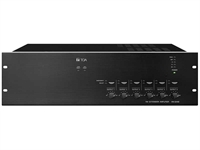 It is equipped with eight audio outputs and two inputs which can be mixed and output.